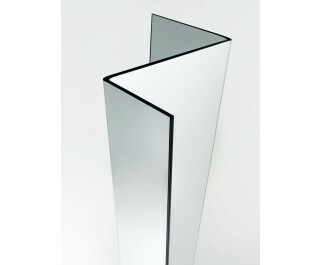 Curved standing mirror, characterized by clean-cut formality. In fact, thanks to its double curvature, the mirror is selfsupporting without need of a base or a support structure. The result is a three-dimensional mirror, the surface of which is orientated at different angles, deconstructing space and creating interesting reflective tricks of light. Available in single or doublefaced version, achieved by laminating two sheets silvered in the same way.